We spend so much money on our instruments, but like a high performance race car, they do need regular maintenance if we expect them to keep working reliably. You wouldn’t run your car for 20,000 miles without an oil change, would you? Let’s face it, some of us take instrument maintenance for granted or avoid it due to the cost, a previous bad experience, or lack of a conveniently located and experienced technician. 1. Tell our readers a little bit about who you are and what you do. Flutes, and Hammig piccolos. We have also become the North American distributor of LefreQue as of January 2016. I set up every flute and piccolo that comes from the factory before it reaches customer and dealers hands. Our team makes sure every instrument is playing at its full potential before it leaves our shop. I also work on customer’s instruments that are shipped from all over the world. Before I was a repair technician, I was a lover of music and a musician. I grew up listening to my mother singing soprano at Handel’s Messiah rehearsals and I know every part by heart. I fell in love with music ever since and received my aunt’s hand me down flute when I was in middle school. I kept with the flute all through high school and continued into college. I received my Bachelors in Music Education from Western Kentucky University and studied with the wonderful Dr. Heidi Álvarez. She encouraged me to follow my dream and passion of a repair career and could not thank her enough for pushing me. Even though I did not pursue a career in teaching, I loved teaching children. I still love playing my Miyazawa flute in local pit orchestras, community bands or on my own personal time. I play for my own enjoyment now and love it. When I’m not working in the flute world, I spend most of my time either gardening or working out and lifting weights. I like participating in obstacle races to keep challenging myself. 2. How did you get started or what led you to your current job? I get asked this question a lot because most people don’t know how someone gets started in becoming a repair technician. I have always loved to tinker and mess with my own flute. I was the student in high school who would mess with all the their screws on the flute and then try to figure it how to fix it myself. Anytime I would take my flute in for a quick quick fix, I would ask the repair technicians if I could watch. I know with many flute players, they get stressed once their keys are scattered on a bench but I always found it fascinating. I asked those technicians how they got in to the business. Some had apprenticed with other technicians and others went to repair school. I then researched repair schools and found that there are three in the United States, yes only three. (Laughter) Each program is completely different from each other and ranging from 1-2 years in completion. I researched and asked other technicians where they went and decided on Southeast Technical in Redwing, MN. It is a world renowned one-year program. I had people from all over the world in my program. I learned how to fix every band instrument in one year along with extra courses in violin and guitar repair. 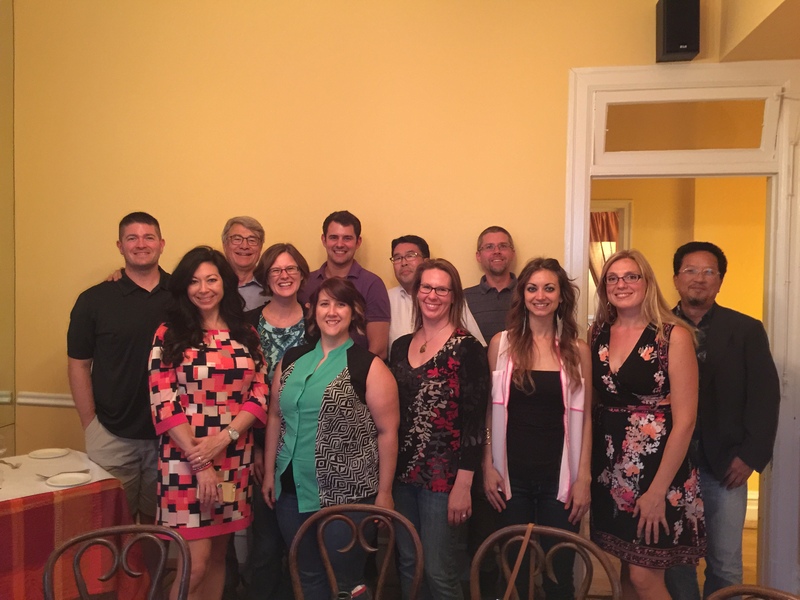 It was a fast paced program with knowledgeable and encouraging teachers. I was fortunate enough to have a representative from Miyazawa flutes come speak to my class and offer an opening in their shop in Coralville, IA. I wanted to specialize in flutes and applied for the job. 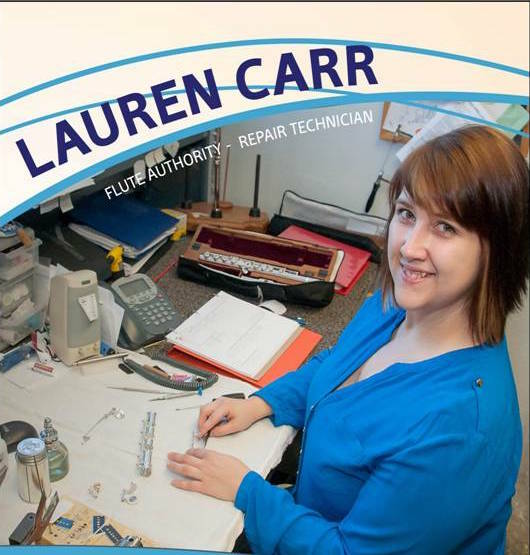 I accepted the position right out of repair school in June 2011 and now have been with the Flute Authority team for 5 years now. I find it really fun and exciting working on unique or challenging flutes. Most of the time, I do straightforward work whether it’s a normal clean, oil and adjust or doing simple adjustments. I have seen several dropped flutes with dents and bent keys and flutes run over by cars. Yes, no joke, I got a flute “thrown” out of a car window and ran over that was partially flattened. But my favorite flute that I have enjoyed working on was my coworker, Liz Virgili’s aunt’s flute. It was an older Haynes that was modified in several ways. It had a high F# mechanism which has an extra lever attached to the F# key that when depressed makes the third octave F# more in tune. Someone had taken the G# tone hole off and covered it with a silver patch and converted the mechanism to an open G# system. I commend the craftsmanship that was done converting the mechanism from the “normal” G# mechanism that we as players are familiar with to an open G# mechanism. Something I’ve never seen before that was added to this flute, is a high F mechanism. There was an arm coming from the G Key that would hit an extra adjustment tab connected to the A key. So basically when you would depress the G key, the A key would close about half way so it would vent properly when playing third octave F.
I thought it was amazing that someone had changed and added other components to the mechanism that a player wanted. I had overhauled this flute and it was refreshing to have extra things challenge my skills that I have never encountered before in my career. 4. Could you give our readers some pointers about instrument maintenance and finding a repair technician? I always recommend players get their instruments serviced annually if they are playing them regularly. Getting your instrument serviced is the equivalent of getting an oil change for your car. Eventually, neither will work if they are not serviced which is why there are recommendations when they should be done. Something as simple as taking your flute apart properly and putting it together will help in many ways. 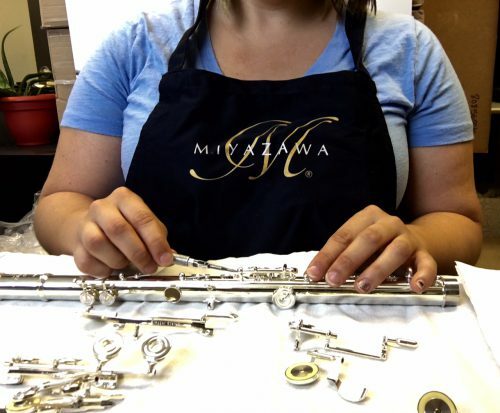 You should never grab the keys when taking your flute apart or putting it together, it increases your chances of bending your keys especially if they are solid silver which is softer. 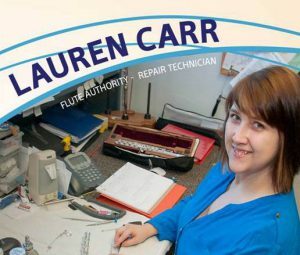 When people ask where they should send their flute for repair, I usually recommend sending it back to the dealer or a flute specialty shop. If your flute has Straubinger pads, always make sure your technician is certified. They are installed differently from traditional pads and if someone is not trained, it will be more difficult for them to make the pad seal perfectly. Any time a flute or piccolo is left on a chair, there is a risk of it being sat on or knocked off. I have seen numerous piccolos that have been sat on and the tenon snapped off. It is usually repairable but fairly expensive. Most repairs I see are for regular maintenance. When someone drops a flute, whether it’s in a case or the instrument assembled, I recommend having a technician look at it. Most times either keys have bent, posts have shifted or new leaks have been created. If a player continues to play on a damaged instrument, it could compound the damage, making it worse or more than likely won’t be playing to its full potential. 6. Any last words of advice to flutists that you can share from your perspective that you feel might be important? We as technicians want to help keep your instrument(s) to be in great playing shape; whether that’s giving advice on how to maintain, teach simple tweaks you can do yourself or doing yearly maintenance. It’s always a great feeling after repairing someone’s instrument and hearing them make beautiful music, I know then I did my job well.